We hope to provide Bursaries to all qualified applicants however please understand that our ability to fund will depend on the funds we raise. The Board of Directors will review the applications and make the final decision on the awards. Please read the following notes about the Bursary. At the bottom of this page there is a link to the Participant’s Application Form. Although we strive to make Tour du Canada as affordable as possible, finding the funds to participate can be challenging for young people who have not started their working life or have loans and fees to deal with in pursuing their education. We want to encourage participation amongst this group of individuals because often once having completed their education they do not have the time or the resources to participate because of debts accumulated during that time. Thus many need to wait until retirement or they obtain seniority in their employment in order to participate. You must be a member of the club Tour du Canada. The membership form is here: Pdf Form or online: Tour du Canada membership. Applicants must be under 25 years of age at the start of the Tour du Canada ride in which they are planning to participate. If you are close to that age range we will consider your application if there are other circumstances that you feel should be considered. For those under 18 we will need the involvement of a parent or guardian. You must be a full time student, or have graduated from a full-time accredited eductional institution within the past 12 months. Applicants do not have to be Canadian citizens, however if you are from overseas you will need to ensure that you may enter and stay legally in Canada for the duration of the tour. Non-Canadians should contact the Canadian embassy or Consulate in their home country for information on entering Canada for a vacation. Applicants must complete the Bursary Application Form and all forms required to register for the trip. You need to register for the trip in the same manner that all participants register. Participants who are awarded a Bursary will not be identified publicly. 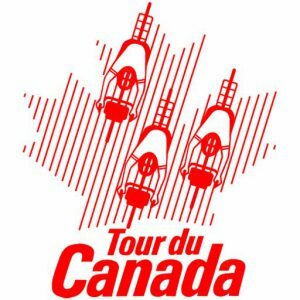 They will be full participants on the Tour du Canada and the expectation is they will participate and enjoy this trip in the same manner as any other participant. A recipient is not required to do any fundraising or promotion work in order to receive a Bursary. As with all past riders we will encourage recipients to stay involved with Tour du Canada after their ride and this includes contributions to the fund when able. This will help other young people to participate in Tour du Canada in future years. The application form is available in pdf format. You can fill in the form on-line but you must print the form off, sign it and mail or fax it to us. You will find the toll-free fax number and mailing address on the form. If you have any questions about the form or you application please contact us at: sweep@cyclecanada.com or 705-434-1100 or toll free in North America 800-214-7798. The Bursary is a project that began in 2008 to celebrate the 20th anniversary of Tour du Canada. It is funded by members of Tour du Canada, Cycle Canada, the Veloforce Corporation past and future riders and their families.